We're giving birth to a new column today — it's called LADYist. With our first edition coinciding with the Labor Day weekend, we thought, let's celebrate the other kind of labor: the miracle of birth. Plans change: Things move quickly and that often means the best-laid birthing plans get tossed out the window. "You can't and won't be ever fully prepared. Just go with the flow, and see what happens. Every woman is different and every baby is different," advises Edith Arbid of Pasadena. Labor playlists are a thing: A lot of you dropped the idea of listening to that music playlist you'd carefully put together. Some of you skipped making one at all, but those of you who did shared the music you wanted. We've compiled it on a master "push-it" playlist. Support is key: Your stories stress the importance of partners, friends, doulas, nurses, midwives and doctors. It's not over when the baby's out: This is something many of you weren't prepared for. "Surprising [to me] was how much recovery I would need. 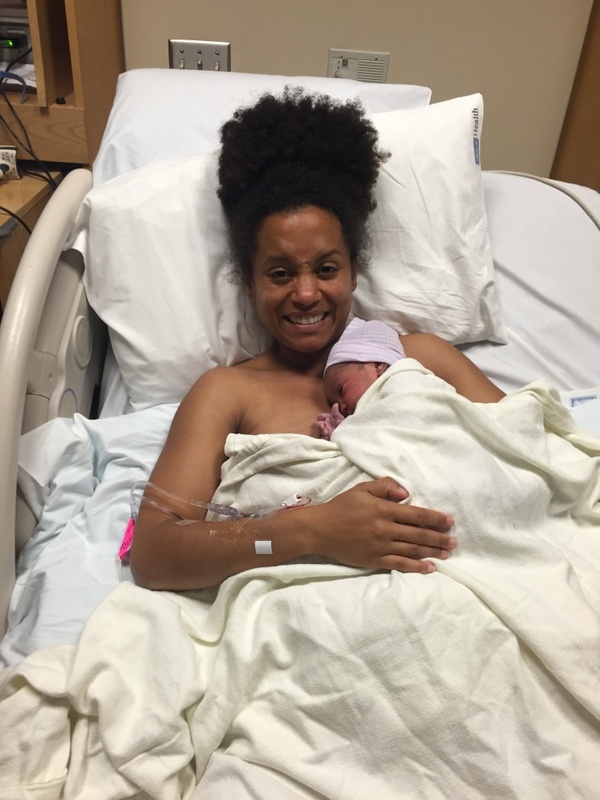 How painful and sore and weak I would be for the next couple of weeks," writes Ashley Potenza of L.A.
"I WENT HOME AND ATE MY PLACENTA"
Long story short: I hypnotized myself, had a short unmedicated birth at the hospital with a doula. Then, I went home and ate my placenta. I'm not sure if that helped or not, but maybe now I will live forever. -Louise Yang's only child debuted in Hollywood. She works as a lead software engineer at KPCC. "MY FIRST EXPERIENCE WITH LABOR AND DELIVERY WAS ALSO THE WORST DAY OF MY LIFE"
I had my first child, a boy, at 23 weeks' gestation. 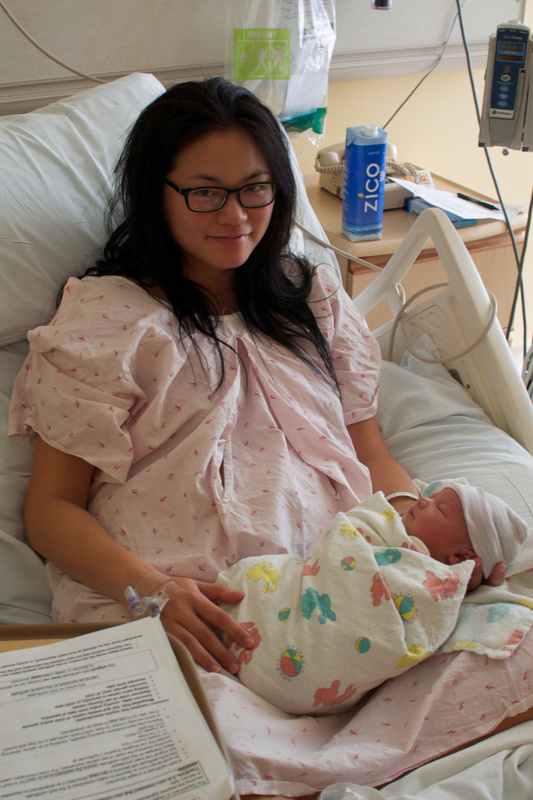 So my first experience with labor and delivery was also the worst day of my life. I was terrified and sad to go into labor. The experience was surreal. I barely remember it, except that it was painful and fairly fast. I had been alerted to a problem with my pregnancy at my 20-week prenatal appointment. That led to two weeks on hospital bed rest and one week on bed rest at home. Unfortunately, we were not able to stop my son from coming so early, and he was born before his lungs were ready and his eyes were even unsealed. I didn't see him when he was born, because the neonatologists immediately grabbed and intubated him. Then they rushed him to the NICU, where he spent three-and-a-half months. He was born at the end of February, and I held him for the first time on Easter (April 4, 2010) of that year. He survived, and he's a healthy eight-year-old now. -Audrey Diehl gave birth in Pasadena and lives in Los Angeles. The second time around, I knew exactly what I wanted. We draped prayer flags interspersed with well-wishes written by friends and family in the small birthing room — the indoor enclosed sleeping porch of a two-story, 1908 Pasadena bungalow. I had practiced self-hypnosis with CDs and had committed to daily perineum massage. My daughter was 4 and was so prepared, with jobs and special people to take care of her. She kept me hydrated with electrolytes in a glass with a straw as I labored in the birthing pool. The music (I can still hear it) was the music from the hypnosis CDs, soft, soothing, with gentle waves rippling throughout. The reminders of my months of practice came subconsciously as the sounds caressed my ears. My son was born in the dark, quiet morning hours. My daughter cut the umbilical cord and helped the midwife weigh him. We laughed, as he did baby pushups in his Apgar exam. Then we all rested. 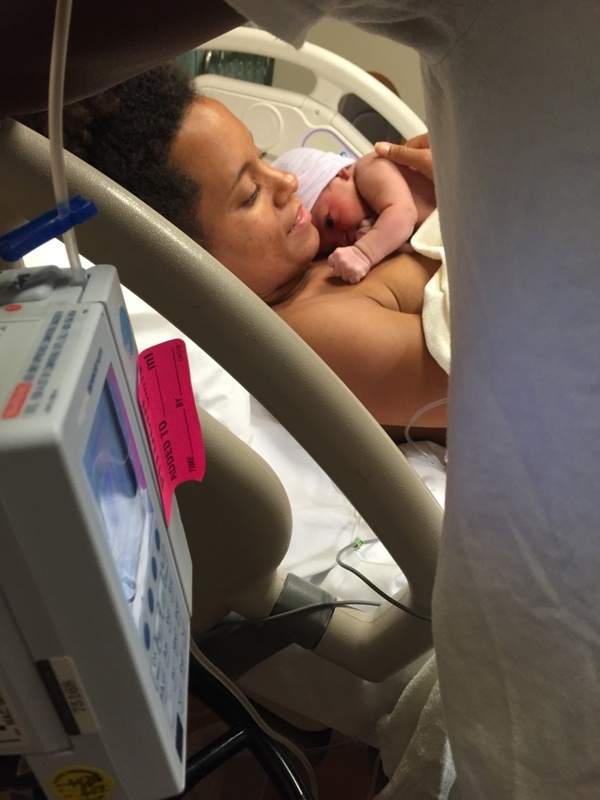 Surrounded by my daughter and husband and holding my new son, I felt complete peace. It's what I like to call "complete motherhood bliss." No one talks much about the afterbirth, but I was prepared. I still remember the joy I had when I realized the morning after my daughter was born that my father-in-law had properly disposed of and cleaned the birthing pool, and my mother-in-law lovingly washed and froze my placenta. We planted the placenta under a tree: new life giving new life. -Kimberly Berry labored at home in Pasadena. We were actually stopped by a cop for speeding on the way to the hospital. It was like a movie. "My wife is having a baby!" my husband yelled. "GO!" was the reply. Labor itself was all the things you might think: intense, painful, and then some. I chose a drug-free labor, and I think the body has its own way of getting you through it. It's hard to explain, but it was like being on another plane of reality. I could hear myself moaning, but I was practically out of my own body, as if listening to someone else making those strange sounds. The nurses were telling me to put my body this way or that, and I remember hearing them, and even understanding what they wanted, but having no desire (or capability) of cooperating. I ended up giving birth sitting upright on my knees, facing the wall, holding on to the bed. And no matter what they were telling me — I wasn't trying to be difficult, I just simply was overcome by this force that my body was going to do what it wanted. It was like my body was on autopilot, controlled by some ancient ethereal biology that no reason could interfere with. It was otherworldly and really the best encompassing word for the experience is psychedelic. -Ashley Potenza moved to L.A. after giving birth in New Jersey. "ALL I REMEMBER WAS PUSHING THROUGH THAT 'RING OF FIRE' — TWICE." On week 39 of a twin pregnancy, one of my husband's coworkers foretold that I would be in labor by the end of that weekend. I had been "nesting" for the previous four weeks: preparing the nursery, washing baby clothes and such. Strangely enough, I felt very calm that Sunday of week 40. I woke up very early, took out our wedding china, cut some roses from our garden, and made a lovely breakfast for us. Later that night after laughing our heads off while watching "Nacho Libre" at the local theater, my water broke when we got home. Instead of feeling nervous or panicked, I asked my husband to take my photo in the middle of the twins' room wearing a pretty summer dress, so that we could remember that moment. Then my husband rushed me off to the hospital. After two and a half days of labor, I was able to deliver our healthy twin sons naturally. They came nine minutes apart. Towards the end, all I remember was pushing through that "ring of fire" — twice. That was in the summer of 2006. "I COULDN'T WAIT FOR THE DOCTOR"
I thought I was hours away from delivery. The contractions were getting stronger, but I remembered how hard it got with my first, and I wasn't there yet. When labor started to get hard around midnight, I remember buckling down and preparing myself mentally for a tough few hours. My husband rubbed my back. My doula Cheri reminded me a few times to let her and the medical staff know when something changed. She said something like, "You'll know. You'll know when it is time to push." Well, about an hour later, that change happened. No one was expecting it to come that soon (except maybe Cheri). The nurse came in to check how dilated I was, and I remember so clearly the hint of panic in her voice when she said, "She's complete." I was 10 centimeters, and it was time to push. There was a flurry of people in and out of the room. The nurses were telling me to hold on, not to push, to wait for the doctor. They told me she was close. I asked, "Is she in the hospital!?" (She wasn't.) I knew there wouldn't be much holding on. Cheri was standing by my side, very calmly and steadily telling me, "Listen to your body. Just listen to your body." I couldn't wait for the doctor. Cheri assured me that nurses deliver babies all the time. And with three or four pushes he was born just a few minutes before 1 a.m. The cord was wrapped around his neck, so he came out a little blue. I remember not hearing the cry right away and could sense something was up. I asked with a bit of panic if he was okay. He was. He cried. My husband cut the cord. They gave my son some oxygen, and things were normal. The doctor arrived a few minutes after he was born. I remember thinking, now I know why women have babies in cars on the way to the hospital, because things can change very, very quickly! -Jessica Yarger's son was born in Glendale. 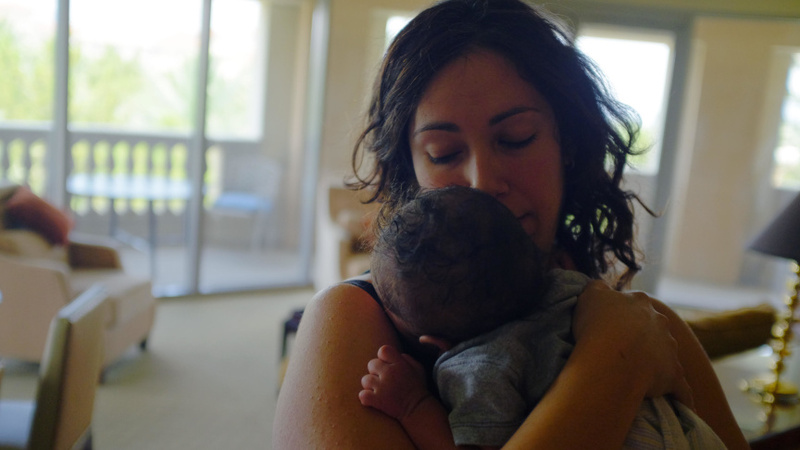 "MY CONTRACTIONS NEVER REALLY GOT SUPER NORMAL"
I had the option to have [the birth] fully paid for by my health insurance if I had my son at a hospital, but I opted for a birth center and a midwife. I had prodromal labor (start and stop contractions) for two days before the big day. My contractions would pick up throughout the night which made it really hard to sleep. I was constantly texting and calling our midwife. She advised me to take a Benadryl and a cocktail to sleep for two nights to make sure I had the energy for labor, which worked like a charm. The last day, my midwife made me a castor oil shake that I drank when I got up in the morning. I went into my birth center around noon that day to check in. I was having contractions, but I was not very dilated. They advised me on how to make lower sounds, so my contraction mantra became the word "hot". I was pretty shocked at how painful contractions were!! I definitely did not feel prepared for that. After the appointment, I labored the rest of the day at home, was pretty miserable, my partner Mike was helping, but also trying to get me to bounce on a birth ball, which I found to be excruciating, so I was really irritated! My contractions never really got super normal. Our midwife kept on asking us the frequency of the contractions, but it was never what they wanted. I don't think they thought I was as far along as I was, because I didn't have the textbook pattern. By like 5 or 6 p.m., I was in our little bathtub at home, which was miserable and way too small, having insanely painful contractions. It was so painful, I was in a trance-like state, and my partner said I was babbling nonsense. Mike knew what was up though, because we took these really expensive birth classes (12 of them!!). He was watching for what they call "the emotional map" of labor and knew exactly when we were in the transition phase (the part right before pushing). Finally, around 8 p.m., Mike convinced the midwife to let us come to the birth center and as soon as I got there, my water broke. I basically got in the tub from that point on (their tub is great, I really wish I had had the opportunity to labor longer at the birth center) and started pushing. Our son Mansa came out within an hour and a half. He was not delivered in the tub, because he was holding onto his head with his hand (cute!). So, they thought it was safer if I got out for the final pushes. I think with two pushes out of the tub, he was out. Overall, I think pushing was the easiest most manageable part. The earlier stages were really hard for me. I was shocked at how soon we were back at home with our son. It was all very surreal. Bringing a newborn home is terrifying! 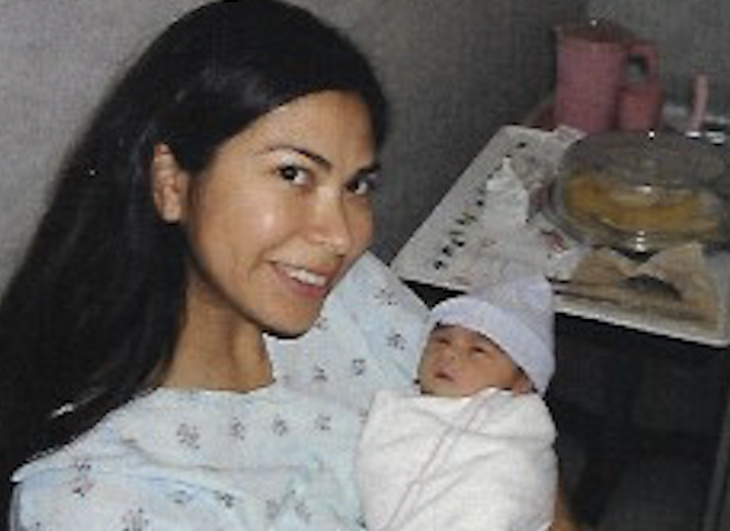 - Elizabeth Gallardo gave birth in South Pasadena. "EVERY CONTRACTION FELT LIKE MY HIPS WERE BEING TORN APART"
The car ride to the hospital (I can now say) was comical. We traversed the 10 Freeway with me screaming and crying out the window with each contraction. The contractions were like the most severe stomach cramp you've ever had times ten. By the time we got to the hospital, the contractions had completely handicapped my ability to walk. A wheelchair was brought to the car. As a contraction ended, I quickly moved myself from the car to the wheelchair. I recall screaming in pain all the way to labor and delivery, begging the nurses to make the pain stop. Suddenly my water broke, releasing a torrent of blood and other fluids. That's when they told me I was eight centimeters dilated. Every contraction felt like my hips were being torn apart and the pain would spike upward more and more, and then suddenly subside. I cringed knowing another contraction was coming and it would be worse than the previous one. I gladly took the epidural, which I had to remain perfectly still to receive. It took all my willpower to hold still. Once under the effects of the epidural, childbirth was a pleasant experience. The only telltale sign of contractions from then on were the spikes seen on the TV monitor. The time came to push and, from what the nurses tell me, my son literally flew out. - Linda Parocua had a son and lives in Chatsworth. "EVERY SINGLE DOCTOR I CALLED IN THE AREA REFUSED TO TAKE ME"
My third pregnancy and delivery was the most stressful experience of my life. When I was 25 weeks pregnant, my husband transferred schools, and we had to move from Los Angeles to Riverside County. My insurance was MediCal, and I couldn't get a hold of my case worker to switch insurance from L.A. County to Riverside. It took me several weeks to contact my case worker, and she berated me for not using "straight Medi-Cal" to be seen at a clinic during that time. I wasn't aware this was an option. I finally got all the paperwork transferred, and every single doctor I called in the area refused to take me as a patient. They denied me care because I was "too far along in my pregnancy," and I hadn't been seen by a doctor for more than three weeks. So I was considered high risk. Hearing this was very infuriating and caused me a lot of stress. I called doctors every day to see if I could be seen. They all said the same thing. My husband and I decided to pay for 3D ultrasounds once every two weeks just to make sure the baby was progressing at a healthy rate. She was. I eventually received the information for my new case worker. I asked what to do when I went into labor and was told to just go to the nearest ER. I was a week overdue on my due date and couldn't sleep. I knew my baby was fine, but I was completely distressed about the uncertainty of who my doctor would be. I decided to try natural ways to induce labor. I made cookies, did yoga, ate balsamic dressing and spicy foods, bounced on an exercise ball, climbed stairs and took a hot bath. Finally, I decided to pull out my breast pump. Within 20 minutes of using the breast pump, I felt a huge contraction and felt terrified and maniacally excited at the same time. I took a warm shower and was surprised at how fast and hard my contractions started to come. My husband and I hopped in the car at 5 a.m. and headed to the hospital. When I got there, I was dilated to four centimeters, and the nurses were trying to get all my files in order to admit me. They asked for some of my test results. I told them I never received a form with my results, but the test was administered at county. The nurse told me it would be very easy to find. They didn't find it and spent a lot of time admitting me. When I asked the nurse if I would be getting an epidural she said, "You'll be okay." I immediately broke into a sweat and panicked. My husband tried to calm me as they wheeled me into a room and tried to draw my blood. The nurse drawing my blood was very nervous. She inserted the first needle into the inside of my elbow and it fell from the vein. She tried the wrist and fumbled the needle, dropped it and had to go get another. I'm pretty sure I was screaming so much at this point that I was making her a nervous wreck. The contractions were really intense at this point. They brought in a phlebotomist to finally insert the needle. The nurse practitioner informed me that she was leaving because she would be switching shifts with the doctor. Before she could leave, the nurse checking the baby's vitals on the monitor asked me to tell her when I felt like I had to make a bowel movement, to which I screamed, "I have to pee and poo!" Almost out the door, the nurse practitioner turned on her heel and said, "Let me check your cervix really quick." When she checked, my water broke. My water had never broken on its own during labor before. She then told me it was time and to wait for her to dress again. She kept talking to try to calm me, but she was getting dressed so slowly and I was in so much pain I yelled at her to "Please stop talking and get dressed!" I was in so much pain. I was either digging a hole into my husband's stomach, grabbing onto his belly with my fist or squeezing his hand. He tried to joke with the nurse that I was "breaking his hand." She replied, "the ER is downstairs," with an eye roll. This is hilarious to me now, but at the time I could only think about the crippling pain radiating throughout my whole body. The nurse practitioner finally got dressed after what seemed like an eternity and told me to push on the next contraction. I honestly don't even know if I was having a contraction or not, I just pushed and didn't stop. My baby pooped out on the first push. She was born within two hours of me going into labor, at 6:57 a.m. She is completely healthy to this day. 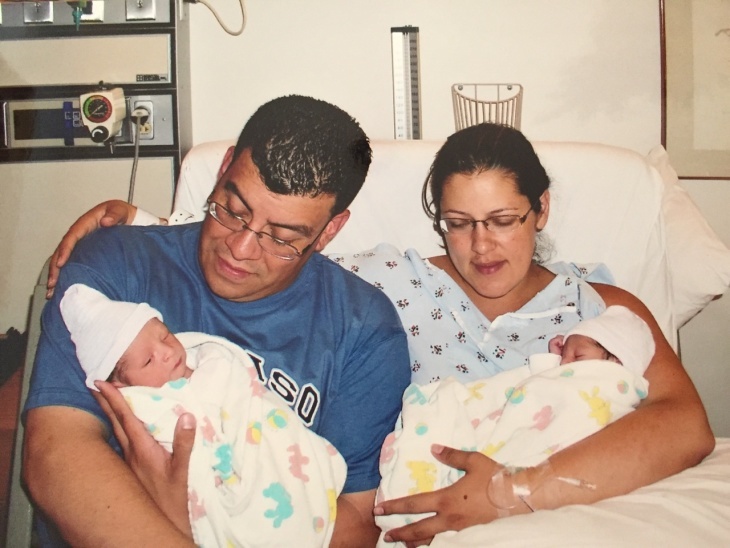 -Marissa Jimenez moved from L.A. to Riverside County before giving birth. "THAT SAME CYCLE: CONTRACTION, BARF, BABY HEART RATE ISSUE"
I started active labor the day before my due date at around 5 pm. I was told that contractions would be like "really strong cramps," which is absolutely ridiculous. I thought my pain tolerance was moderate having had a few knee surgeries in the past, but this was nothing I could have ever imagined. As contractions grew stronger, I would become nauseated and I vomited. When my stomach had nothing left to give, the vomiting gave way to dry heaving.I never got to relish the break in between contractions, because I was heaving over the toilet. Our doula and my good friend, Leora, arrived around 10 p.m., and she started timing contractions to determine when to go to the hospital. Meanwhile, I am filled with dread between each contraction, knowing the next was around the corner. The $100 class and the movies told me to focus on breathing during the contractions, but I actually had a lot of trouble barely inhaling each time. I also was experiencing a great deal of back pain, which was unexpected. By 1 a.m. or so, it seemed like time to go to the hospital. I get checked and the nurse checks my dilation: one centimeter, or basically zero progress, after 8 hours of excruciating pain. When they let me know they would be sending me back home, I really didn't think I was going to make it. I had another world-ending contraction, barfed some more, and set off the baby heart rate monitor machine so then I got admitted. I continued for the rest of the night in that same cycle: contraction, barf, baby heart rate issue in response, repeat. I had an oxygen mask on me for most of it to help speed up the oxygen to the baby. I needed it since I still couldn't inhale during the contractions, which seemed to be longer and more terrible each time. At 6 a.m. they checked my dilation again: barely two centimeters. A new nurse who had just come on duty did a closer exam and realized that the baby was posterior, facing my back. This now explained ALL of it: the horrible back pain, the more intense contractions, and the unproductive labor. I still think to this day of what would have happened to me or my son if they sent me home. At 7 a.m., the new nurse and the anesthesiologist changed everything. I got an epidural and the nurse worked on putting me in different positions to get the baby to turn around. We all got a nap in, and I felt like a human again. Labor continued for a long, uneventful while after that until a particular contraction had me reaching for the self-administered increased dosage of pain meds. Three seconds after that, about five nurses and the doctor rushed in the room, flipped me around like a pancake in a bunch of different positions, and ultimately whisked me away to the operating room without me even having the chance to glance at my husband. I'll always remember the moment I reached for a random nurse's hand to hold it. The baby's heart rate had dropped dangerously low during that last contraction, and after reading the record, the doctor was shocked at how long the contraction lasted. We got ready for an emergency C-section. The doctor knew I preferred a natural birth. So we agreed that if it happened one more time, we'd proceed with the C-section. We all ended up waiting in the operating room, playing Otis Redding and talking about nothing in particular. After a few more contractions, the baby seemed fine. So I was rolled back to the room to continue as before. What a damn rollercoaster! Finally, close to 8:30 p.m., it was time to push. I had never been so determined. The only part of this whole fiasco that went well for me was that it only took 30 minutes of pushing to get Chase out! Right on his due date. - Jenny Vazquez-Newsum had a son in Santa Monica.